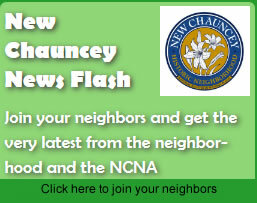 The New Chauncey Neighborhood Association has been publishing neighborhood updates for the community since at least 2001. We began archiving the electronic versions in the fall of 2006 and will continue to add to the archives as time marches on. In 2009, we moved to a once per year paper newsletter publication saving resources and adding less to our local landfills. We electronically publish community updates when needed, often multiple times a month when issues effecting the neighborhood are being discussed by the City or County. Otherwise we publish the newsletter when needed. You can also follow us on Facebook and Twitter, if that makes your life easier. The hard-copy newsletters archived below reflect the community issues and concerns, the events and projects sponsored by the NCNA and of course some interesting stories and musings along the way. A historical perspective. Please enjoy the issues that have been preserved here and remember when browsing, that while at the time of publication the information was generally correct, these documents have not been updated and may now be out of date or incorrect. Now, pour that cup of coffee, tea, or other favorite beverage, sit back and enjoy the archived versions of our hard-copy newsletters.